If I were to say that I am no longer in the springtime of my youth, I would be considerably understating the matter. These days if ever I claim to be “pretty fit” I always feel obliged to add “for my age”. My New Year’s Resolution this year, was to do something to improve my existing fitness level. And the first weapon in my fitness armoury is the iOS app, You Are Your Own Gym. Currently my main form of exercise (apart from walking my dogs) is Aikido. This is a Japanese martial art that I either teach or study three times a week. In fact, it was the Aikido that made me realise I needed to work on my fitness. It is a physically demanding art and, to be honest, I am increasingly finding it hard to live up to those demands. When I posed a question about fitness training for the older martial artist (in a Facebook group called, rather colourfully, Old Farts Martial Arts) one of the recommendations a fellow martial artist made was the You Are Your Own Gym iOS app. I duly bought and installed the app on my iPad (a mere $2.99 – it is also available for Android). The app itself has over 200 ‘bodyweight’ exercises that can be performed at home, or wherever else you happen to be, without using any special equipment. Most exercises can be done standing or lying on the floor or using everyday items such as tables, chairs, doors and towels. You can create your own exercise programs or (as I am doing) you can follow a pre-defined 10 week course. The app comes with four 10-week workouts for beginners through to experts. Each of the beginner-level workouts take around 20 to 36 minutes or so to complete including some rest periods between exercises but no including warm-ups and cool-downs which may add on another 10 or 20 minutes. Higher-level workouts can take a bit longer. The exercises are all shown in video clips and there are text-based instructions to provide more details. The first time I used the app I made the mistake of trying to keep pace with the video display. Having failed to do so I ended up in an exhausted heap on the floor. It was only then that I realised that the video clips run in an endless loop and they are there to show the correct form, not to set pace for the user! In fact, each exercise should only be done for the indicated number of repetitions. The precise workout varies from day to day – some days require more stamina, others require more strength. Also the target muscle-groups change from one session to the next so there is plenty of variety to avoid boredom, and plenty of time for specific muscle groups to recover in time for their next targeted session. Overall I am mightily impressed by this application. I’ve been using it for over six weeks and so far I haven’t missed a single of the four sessions per week which I’ve scheduled for myself. The exercises are well explained and demonstrated, the workouts are well designed and the production quality is first rate. There are just two minor criticisms: 1) a friendly introduction video would have been useful to give an overview of exactly how to use the app and 2) more warm-up and cool-down routines would have been good to have. 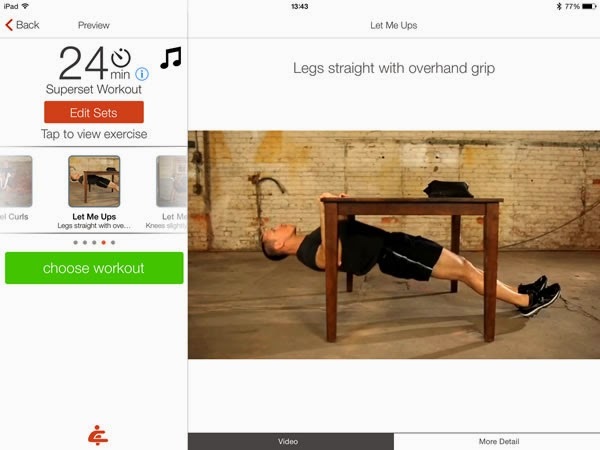 The app has just two warm-ups and cool-downs which are presented as fixed sets of exercises which (unlike the exercises in the rest of the app) allow for no variation. But those niggles aside, this is a fantastic app – well worth the mere $2.99 I paid for it. Exercises are done using household furniture as equipment so they can be done almost anywhere. The app creator, Mark Lauren, also has a DVD set and a ‘You Are Your Own Gym’ book. Having used the app for a couple of weeks I decided to buy the book too, as it is useful as an ‘offline reference’. However, the book is by no means a requirement. 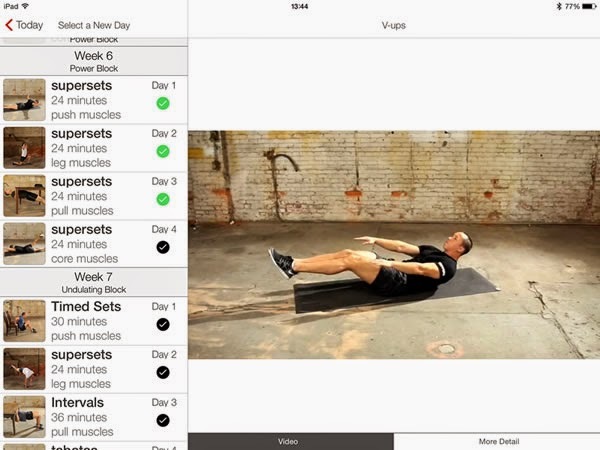 The app is a fully self-contained training guide. If you need to get fit and don’t want to go to a gym in order to do so, this app is well worth getting. If you are serious about getting fit, I strongly recommend it!